Thought it would be nice to do a contest before Christmas. Just submit a picture of you in bearville doing your favorite winter/holiday activity. Example ice skating, playing dress up with fluffy coats and boots, hanging out with your friends in the north pole, relaxing in your Christmas themed condo, you get the idea. You have until Tuesday at 8pm EST to submit your entry. Winners will win some cool bearvile items (would do bears, but no way am I going near the mall this weekend, its madness of last minute shoppers). Can't wait to see the entries and spread the word to get a little Holiday Cheer around here. Wrapping presents and baking cookies is always fun ! Cute entries so far. Can't wait to see more. I'll be announcing the winners either Tuesday night or Wednesday so please be ready to claim your prizes one of those days. Me and Faye (Mrs Claus!) dancing to Christmas music in my Condo. 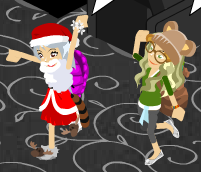 I don't think we'd seen each other on Bearville for years, but within minutes we were dancing together and having so much fun. It may not be the most Christmassy photo out there but for me, Christmas is an opportunity to spend time with old friends and family and 'catch up' with each other outside school. I hope our pictures, along with my Mrs. Claus outfit and Neon's Santa Sack backpack and glass slippers really capture the spirit and joy of Christmas. omg faye and neon you guys are the cutest pair of BV friends ever! I like all the entries.Who won?